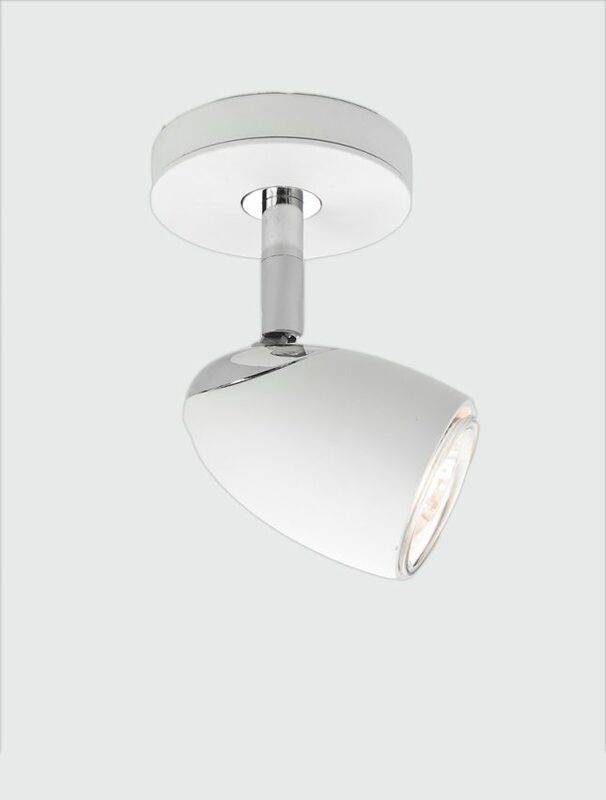 The Ovale Single Spotlight has a cream and chrome finish which creates a classic contemporary feel. This Spotlight is fully adjustable allowing you to direct the light to your desired location. The Ovale would sit well lighting a picture or helping to illuminate an area in your living space. 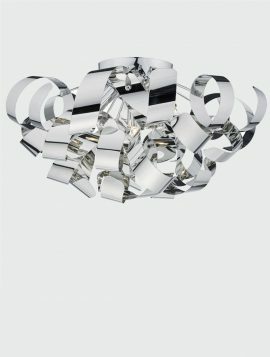 The Rawley 5 light flush ceiling light has a polished chrome ribbon finish and a complimenting polished chrome backplate. This stylish wall light adds a contemporary feel and a piece of art on the wall, creating a beautiful pattern and striations on the wall when switched on. We recommend using a dimmable light bulb to control your level of lighting. The Rawley flush ceiling lights look great in modern hallways or kitchens with lower ceiling heights. 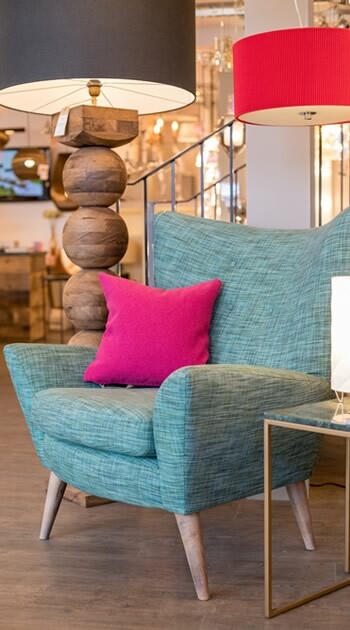 Complete the look with a Rawley pendant or wall light. 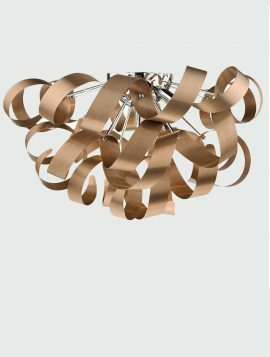 The Rawley 5 light flush ceiling light has a brushed copper ribbon finish and a complimenting brushed copper backplate. This stylish wall light adds a contemporary feel and a piece of art on the wall, creating a beautiful pattern and striations on the wall when switched on. We recommend using a dimmable light bulb to control your level of lighting. The Rawley flush ceiling lights look great in modern hallways or kitchens with lower ceiling heights. Also available in: Brushed Aluminium and Polished Aluminium. Complete the look with the Rawley Wall Light, 4 Light Flush Pendant or Pendant. The Ascoli spotlight bar has a contemporary style which would suit any modern kitchen or living space. It has three bronze spots with matching backplate, these spotlights are fully adjustable and can be angled to a specific area. Also available in: Matt Nickel and White. 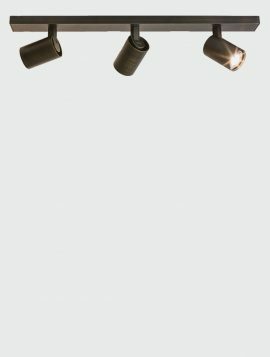 Complete the look with the Ascoli Wall light, 4 Spotlight Bar and Triple Round Spotlight. 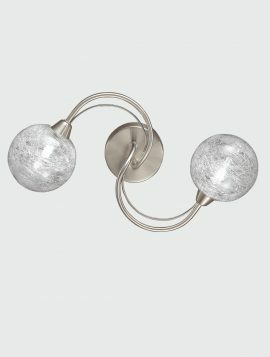 The Gyro double wall or ceiling light has an satin nickel finish with clear glass spheres filled with fixed, spun glass strands. The Gyro has beautiful twisted metalwork which adds a contemporary flowing feel. Add dimmable lightbulbs to control your level of lighting. The Gyro can also be fitted as a flush ceiling light. Also available in: Bronze. Complete the look with the Gyro 3 Light and 5 Light Flush Ceiling Light.